So I am planning to do motovlogging. I have no idea how well this is going to work out for me. Anyway, now what i need is a best action camera with external microphones that i connect directly to my helmet. I am writing this at 8.30 pm. And all day today, I was searching for the best action cameras(cheap options) for motovlogging. OK not all day, at least 6 hours today for this sole purpose. I was watching different YouTube videos, searching in different shopping sites, reading reviews etc. When i started my research, my plan was to go for a cheap one under 5000 rupees. But since i had very specific needs, now i am forced to increase my budget to minimum of 8000 rupees (but still, we will discuss about best action cameras under 5000 also). When i say specific needs, what i mean is functionality to connect an external microphone directly to action camera. I need external microphone support because i don’t want to record audio separately and sync it later. Ever though action cameras are now widely used for vlogging, it is actually not the primary purpose of an action camera. But for vlogging, audio quality is very important. For that purpose, we need to add an external mic or record audio seperately. So which are the best budget friendly action cameras with external mic support ? Finally, i found few good options, and in this post, we will discuss all about it. following list is going to save you a lot… of time. We all know the limitations of Chinese brands when it comes to warranty, product quality etc. I will be choosing models from most reliable Chinese action camera brands, out of available options. Those brands that are in the market since few years. These include Xiaomi Yi, SJCam & EKEN. I chose these brands because they offer good products under a price range of 10000 rupees. 5 Best Action cameras with external microphone option under 5000($70),6000, 8000($90) rupees. 1) SJCAM SJ6 LEGEND with SJCAM Mini External Microphone. My final choice of camera for motovlogging is SJCAM SJ6 LEGEND with SJCAM Mini External Microphone. YOu may ask why, this camera – mic combo have features that can help you make pro quality videos, at the most affordable price. SJCAM models usually comes with all accessories such as Waterproof Housing, Adhesives , Bicycle Mount, Base x 1, Clip, Switch Support, Helmet Base, Bandage, Mount 1, Mount 2, USB Cable, Wipe etc. Price of above mentioned combo will be around 10000 rupees in Indian eCommerce stores. But this combo can be purchased for around 8000 rupees if you import from Chinese stores like www.banggood.in(If you create a new account using this link you will get 10 dollars discount Below is a screenshot of price. 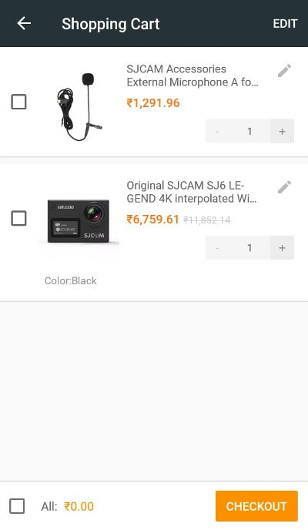 Action camera with external mic under 6000 rupees. 2) Noise Play Vlog Edition. 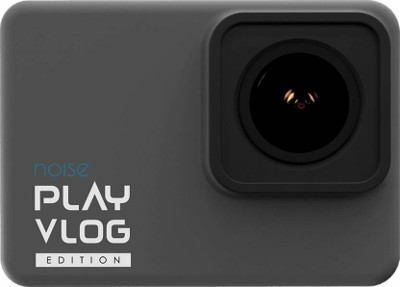 Noise play vlog edition comes with inbuilt mic support in its price range. If your budget is around 6000 rupees, you can consider this Noise Play Vlog Edition. This is a special vlog edition camera from this company. This product comes with a free external mic. It comes with 1 Sports Action Camera, Waterproof Housing, Adhesives x 2, Bicycle Mount, External Mic, Base x 1, Clip, Switch Support, Helmet Base, Bandage, Mount 1, Mount 2, USB Cable, Wipe. Action cameras with external mic under 5000 rupees($70). As i promised, now we will discuss about action cameras within a budget of 5000 rupees. But in this budget, in most cases, external mic option are lacking. But this problem can be solved in 2 ways. Most simple way is to record audio separately and then sync with video later. Other option is opening camera and then adding a 3.5 mm audio jack. Doing this is little tricky and you might end up ruining the product. But if external mic is not that much important, these are good options . So following are some good options under 5000 rupees, without external microphone support. 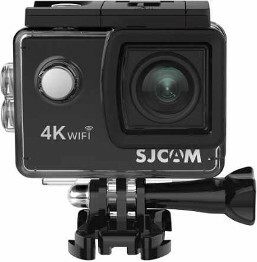 3) SJCam 4000 air / SJcam 4000 wifi. Modes includes : VideoLapse, PhotoLapse, Burst mode, Car mode, Underwater mode and TV mode. This comes with accessories such as Waterproof Case, Bicycle Stand, Waterproof Case Base, J-Hook Buckle, Universal 1/4″ Camera Tripod Mount, Frame Mount, 3X Switch Support, 1, Curved Adhesive Mount, 3M Adhesive Tape, Usb Cable, Multi-Language Manual, Cleaning Cloth, 1X Flat Adhesive Mount, Voice Recording Cover etc. 4) EKEN H9R 4K Action Camera. This is also another camera offering good quality, videos in this price range. Offers performance similar to yi and sj cam. 5) Yi 2K Sports and Action Camera. Yi along with SJcam are most reliable ones out of action cameras from china. Yi 2k is a good beginner action camera within this low budget.